The four teams in the Venture 14 fleet are halfway through their 16-day race from London to Monte Carlo and have just entered the Med. You can read what our resident racing expert Ray Bulman made of the cancellation of the Venture Cup in his blog. Our last update left the teams in A Coruña and since then they have stopped in Figueira da Foz, passed Lisbon and Cape Saint Vincent, stopped in Sines, Portimão and Cádiz, waved at the Rock of Gibraltar and are now all reunited in Málaga. 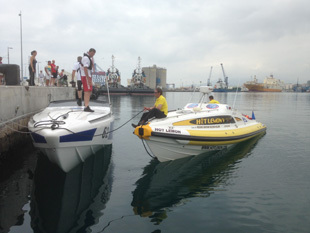 Ever since the cube52.com’s fuel shortage off Santander, with Hot Lemon coming to the rescue, the two boats seem to have become inseparable. When cube52.com decided to stop in Sines rather than the allocated destination of Portimão due to a crew injury, Hot Lemon did the same to keep them company. 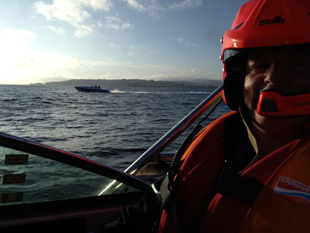 The spirit amongst the four boats is what makes these sorts of feats of adventure so engaging. This has meant that Tally-Ho and Grey Ghost have formed a partnership of their own and been pretty much neck and neck between the stops. This is an interesting comparison; they are identical 10m Scorpions yet Grey Ghost has a pair of 315hp Yanmar diesels and Tally-Ho twin Mercury 300hp outboards. The fuel figures will make for intriguing reading at the end of the event but it’s one nil to the diesels in terms of reliability as Tally-Ho lost a gearbox off Tarifa yet bravely pushed on to Malaga on one motor. They had 100 miles to go on just the one engine and were down to 12mph, but thankfully the horrendous conditions subsided and they could up the pace to 22mph. Fog on day eight brought the teams closer than ever because only half the fleet has radar. So Hot Lemon and Tally-Ho lead the charge through a real pea souper and cube52.com and Grey Ghost fell in behind. The sea state has remained mixed with calm spells being interspersed with much lumpier stuff, resulting in the aforementioned injury on cube52.com and some new business for a welder in Portimão courtesy of Grey Ghost. 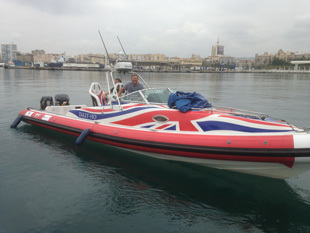 Sunday 15 June, 15:35: “We are the first boat to Málaga! Arrived at 15:00 after another bumpy run, at least it’s very hot and sunny”. The crews have a rest day today before pushing east again in the morning. Remember, if you want to follow the teams’ progress than the Venture Track website is your friend.